James A. Symonds is an American retired rear admiral of the United States Navy who last served as Commander, Navy Region Northwest, based in Silverdale, Washington. He was the former Commanding Officer of the USS Ronald Reagan (CVN-76). He had a prominent, symbolic role in the state funeral of former United States President Ronald Reagan in 2004. Symonds is a native of Sodus, New York. He attended the State University of New York at Albany and graduated with a Bachelor's degree in mathematics in 1975. He later was commissioned at the Aviation Officer Candidate School at Naval Air Station Pensacola, Florida that September and was designated a Naval Flight Officer in July 1976. Symonds served one operational tour assigned as an A-6 Intruder Bombardier/Navigator in Attack Squadron 115, aboard the USS Midway (CV-41). In 1983, he became a naval aviator after being selected for pilot training and returned to Naval Air Station Whidbey Island. He then participated in two additional operational tours with Attack Squadron 196, and was deployed on board the USS Constellation (CV-64) and the USS Independence (CV-62) amidst Operation Desert Storm. In October 1992, Symonds was promoted to Executive Officer of Attack Squadron 165 on the USS Nimitz (CVN-68) and took full command the following October. In 1995 he attended Navy Nuclear Power Training. 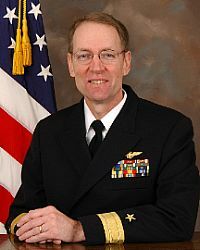 Symonds was later assigned as Executive Officer of the USS Dwight D. Eisenhower (CVN-69), and led the ship on a 1998 deployment order to the Mediterranean Gulf; he assumed command of the USS Nashville (LPD-13) in 2001. In August 2003 Symonds became Commanding Officer of the USS Ronald Reagan (CVN-76), the Navy's newest aircraft carrier. He presided over the ship's transfer from Norfolk, Virginia to its homeport in San Diego, California. On June 5, 2004, while Symonds was commanding officer, former President Ronald Reagan, the ship's namesake, died at his home in California. Upon former First Lady Nancy Reagan's request, the Commanding Officer of the USS Reagan would present her the American flag that draped the president's casket; at the time, it was Symonds. Following a national funeral service in the Washington National Cathedral and six days of public mourning, Symonds presented Nancy Reagan with the flag at President Reagan's gravesite at the Ronald Reagan Presidential Library prior to his interment. Symonds turned over command of the USS Reagan to Captain Terry Kraft on November 17, 2005. His more recent posts have been Navy Director of Environmental Readiness and Commander of the Navy Region Northwest, a position he took up in July 2007. ^ a b c d e f g h i j k l m n o "United States Navy Biography: Rear Admiral James A. Symonds". United States Navy. September 5, 2007. Retrieved 2010-03-12. ^ "Sun Sets as Reagan Laid to Rest in California". Associated Press. MSNBC. June 12, 2004. Retrieved 2008-06-05. ^ "USS Ronald Reagan Departs on Third Deployment". United States Navy. May 20, 2008. Retrieved 2008-06-05. ^ "CNN Transcript". CNN. June 11, 2004. Retrieved 2008-06-05. ^ a b "A Nation Bids Reagan Farewell". CBS. June 11, 2004. Retrieved 2008-06-05. ^ "USS Ronald Reagan Change of Command Ceremony". United States Navy. November 17, 2005. Archived from the original on September 20, 2007. Retrieved 2008-06-05. ^ "Navy Sonar Exempted from Marine Mammal Protection Law". Environmental News Service. January 24, 2007. Retrieved 2008-06-05. Wikimedia Commons has media related to James Symonds.